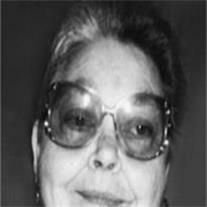 Sharon Ann Jackson, 68 entered into heaven’s gates from her Mesa home on June 25, 2010. She was born April 7, 1942 in Mesa, AZ. She is survived by daughters Nonie Jackson, Carolyn Cornell, Elaine Jackson; grandchildren Anthony, Samuel, Ruben, Matthew, Rebecca, Joshua, Rachel, Kayla, Aaron, Hanna and 6 great-grandchildren. She was a wonderful mother, grandmother, great-grandmother, sister, aunt and friend and will be dearly missed by all who knew her. Sharon attended Celebration Christian Center and was a strong Christian example and had a strong faith in God. A memorial will be held in her honor Saturday, July 3, 2010 at 10 AM at Celebration Christian Center, 1010 S. Ellsworth Road, Mesa 85208. A reception will follow at the church. Burial will be at the City of Mesa Cemetery at 1 PM. Arrangements by Bunker’s Garden Chapel.